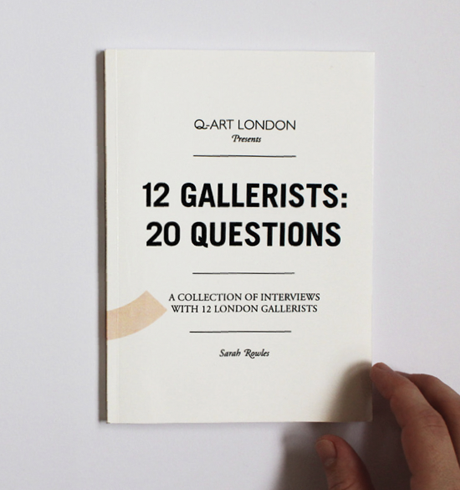 12 Gallerists: 20 Questions – A collection of Interviews with 12 London Gallerists. 12 Gallerists: 20 Questions seeks to de-mystify the world of contemporary art. Sarah Rowles asks 12 respected London gallerists how the art world works. Interviews with: Chris Hammond (MOT); Jari Juhani Lager (Union); Richard Maddalena (Hoxton); Robin Klassnik (Matt’s Gallery); Michael Keenan and Keran James (Studio 1.1); Wolfe Lenkiewicz (T1+2); Matthew Bown (Matthew Bown); Anonymous; Domo Baal (Domo Baal Gallery); Chris Noraika (One in the Other); Peter McCormack (Kinetica); Cynthia Corbett (Cynthia Corbett Gallery). Who values art? How is it valued? Who buys it? Who do gallerists sell to and how are prices decided upon? How are artists selected and how do they make the transition from art school, to the marketplace, to the museum? What’s the difference between the primary and secondary market? What types of gallery spaces exist and where does an artist start? Questions are put to the gallerists in order that the interviewer – and the reader, can develop an expanding knowledge of how contemporary art is evaluated in the market place. 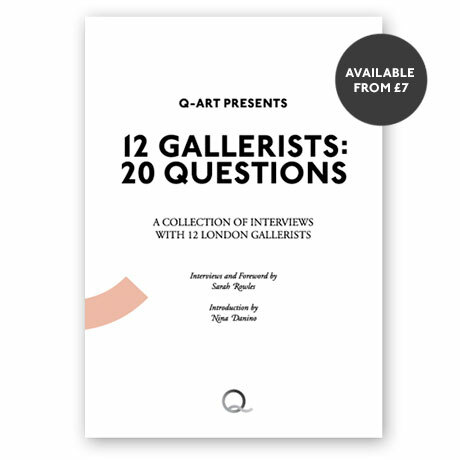 12 Gallerists: 20 Questions provides an invaluable and honest insight for any art student, amateur and professional alike, into the real workings of London’s contemporary art world. “This is a very informative book for a gallerist wannabe like myself! It really portrayed the different characters of gallerists and how they reflect their ideas into their gallery operations.” Graduate and prospective gallerist. * Please purchase this higher priced version of the e-book if you are a staff member and are planning to use the e-book in teaching/ share the content with your class. As a small organisation we rely on the money made from the sales of Q-Art publications to print further books and fund our next research projects. ** Postage is calculated as a flat rate. If you are ordering multiple copies of our books please get in touch with [email protected] to arrange accurate postage costs.